Fourth Row Center: Film Writings by Jason Bailey: Cassavetes: "Gloria"
And who’da thunk it. After all that experimentation, after all that peering into the dark recesses of the soul, after all those self-indulgent actor’s exercises, Cassavetes goes and makes his greatest film—and it’s his most conventional. 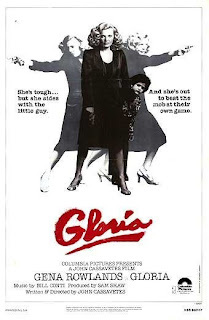 Gloria is the story of a tough dame and a cute kid (that old chestnut), wrapped inside a gangster movie and a chase picture. There’s not a reason in the world that it should be part of the Cassavetes filmography. But it is, and it’s wonderful. Gena Rowlands stars (of course) as the title character, an aging gangster’s moll who ends up stuck with a neighbor’s kid (John Adames) when his whole family is taken out by gangsters; the kid’s dad was a mob accountant, and he handed over his ledger book to his son before it all went down. The motor for the picture, then, is Gloria’s attempt to get the hell out of town before either (or both) of them get killed. Rowlands is electrifying as Gloria—she packs both a pistol and a sharp tongue with equal skill, growling her hard-boiled dialogue with an abundance of moxie. Adames is charming and likable, and the rouges gallery of tough-guy character actors are more than credible. But it is disorienting to watch the film within the context of the Cassavetes filmography—there’s stunts! And shoot-outs! And an overblown Bill Conti score! And yet, he makes it all work, even the most tired and obvious elements. What was he up to here? For my money, the same thing Soderbergh is up to with crowd-pleasers like the Ocean’s movies—he uses the experimentation of his smaller, more personal projects to imbue a smarter, richer sensibility into the big studio pictures. Gloria doesn’t have the kind of on-screen character development as Rowlands’ characters in A Woman Under the Influence or Opening Night, but she has the same kind of rich inner life that those women had. She just has it before the movie starts. I had an epiphany about Cassavetes’ work when I watched Woman back in June; I wrote, “Cassavetes doesn't take anything out. Other movies abbreviate or remove the long climb that leads to those kind of emotional moments; they just give us the high points. Cassavetes leaves it all in. Does that make him a better or a worse filmmaker? That, I'm not sure of.” In Gloria, he finally takes some of that stuff out—and ends up with his finest film yet. If you've got 123 minutes to kill, "Gloria" is available for online viewing at Crackle.